A concoction of rum, almond syrup, triple sec and lime juice, the Mai Tai is a perfectly balanced Tiki classic. As with most cocktails, there is a muddled history with the Mai Tai. Legend has it that Victor J. Bergeron invented the drink at his restaurant, Trader Vic’s, in 1944. However Don the Beachcomber , who originated the Tiki bar concept, claims that he created the Mai Tai at his bar in 1933. A lot of people tend to go with Trader Vic’s story, as he says in his own bartenders guide ‘anybody who thinks I didn’t create this drink is a dirty stinker’. We can never be sure where it originated from, but we do know that it is a great cocktail! We love a pun at Riddles, and our Del even created a ‘My Tie, Not Yours’ cocktail, a twist on the original recipe. Though the name of the popular Mai Tai actually comes from the phrase “Maita’i roa ae!”, meaning ‘out of this world, the best!’ in Tahitian. The name is said to have been born from the phrase being cried out by a customer at Trader Vic’s when they tasted their first Mai Tai. 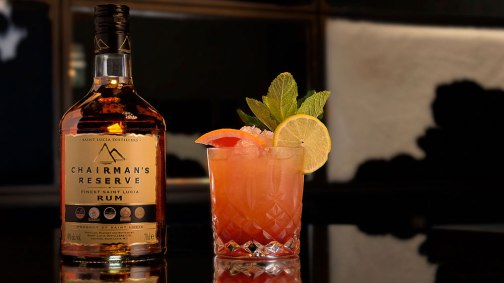 We’ll be creating our own ‘out of this world’ cocktails tonight at the bar with the award-winning Chairman’s Reserve rum from St. Lucia, a treat you don’t want to miss out on! We want you to join in the celebration with us, and our way of thanking you is with £5 Mai Tais! But not to worry if you can’t make it to the bar tonight, we also stock the full range of Chairman’s Reserve rums along with many more spirits and syrups at our specialist shop, Riddles Emporium. Keep up to date with everything that is happening in the bar and shop by signing up to the Riddles Newsletter. Want to be the first to hear about special offers, news, and events? Join the Riddles family - and we'll make sure you know about any amazing offers, special events, or news from the bar! Sign up to the Riddles newsletter now!